Do you already own an Abloy Lock? Security Snobs offers many services to existing Abloy customers. We can rekey and upgrade many existing Abloy locks as well as provide keys for many Abloy systems. For additional keys please see our Customer Keys page. Older generation Abloy systems (prior to the Protec) are not currently patent protected and may have some security vulnerabilities. Out of patent systems are exposed to greater chance of third party key duplication as there are no legal protections on the blanks. This is especially true of the older systems like the Abloy Classic. Older generation Abloy systems also do not have the level of manipulation (picking/impressioning) resistance that the Protec system does. While all generations of Abloy system still provide good levels of security and manipulation resistance, for the best security insist on the Protec, Protec2 based systems. Some Abloy products can be upgraded from an older generation Abloy system to the current generation. There are direct conversion kits to upgrade many of the Abloy padlocks (PL330->PL350) to the Abloy Protec system. Contact us for more details. Abloy has many different generations of locks spanning over a century including: Classic, Profile, DiskLock, DiskLock Pro, Exec, Protec, Sentry, Novel, and Protec2. The type of Abloy lock you have can be easily determined by looking at a key. The head of your key will be made of plastic or metal and will have and the hole in it. 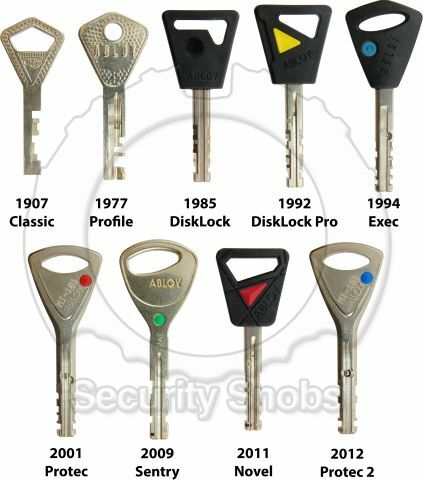 Compare your key to the pictures below to quickly determine what system you have. Please note that both Abloy Protec and Abloy Protec2 keys can have a key bow on them, you can find a picture of this on the Key Bow product page. If you have an Abloy Protec system but are looking for a more restricted key profile, we can rekey most Abloy locks to a new key profile. While a more restricted profile is generally unnecessary, if key control is of the utmost concern, you may be able to increase your security without a large cost.